Pantone, surely the most authoritative word on colour matching, recently launched a new subscription service, Pantoneview, that alerts you to on-trend colours to ‘inform and inspire your colour decisions’. Although I have no need for such a service, I’m sorely tempted to sign up – call it ‘colour curiosity’. For babies and toddlers with colour curiosity, some new releases by Pantone are sure to appeal. First up, gorgeous Pantone: Colour Cards. There are eighteen flashcards in the set, made up of two tones of each of the nine basic colours. 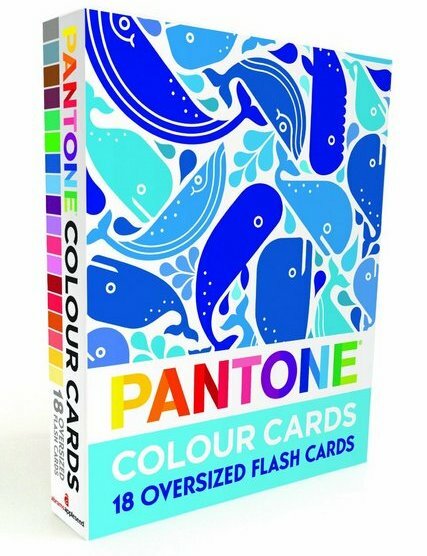 With a solid colour on one side of the card and a modern, illustrated pattern of animals or objects in shades of the same colour family on the other, the cards are both educational and beautiful to look at. Colours include Shark Grey, Grasshopper Green and Duckling Yellow – the challenge for children is to look at the illustrations and pick out which shade is Shark Grey, Grasshopper Green, Duckling Yellow and so forth. 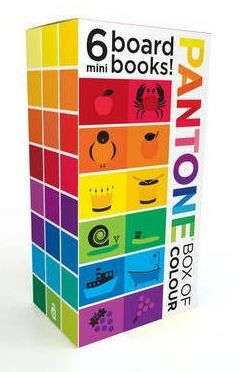 Also new is Pantone: Box of Colour, a set of six small, chunky board books, one for each of red, yellow, green, purple, orange and blue. Each book includes durable die cut-outs of familiar objects against various shades of each colour. Simple text cues parents and children to label objects and observe lighter and darker shades of the same colour. Both the flashcards and the books are suitable for children aged one year and over and are available from Book Depository. For grown-ups with colour curiosity, check out Pantoneview.